Neil Young joined host Jimmy Fallon for a duet of his 1972 classic, “Old Man”, on NBC-TV’s The Tonight Show on Tuesday. 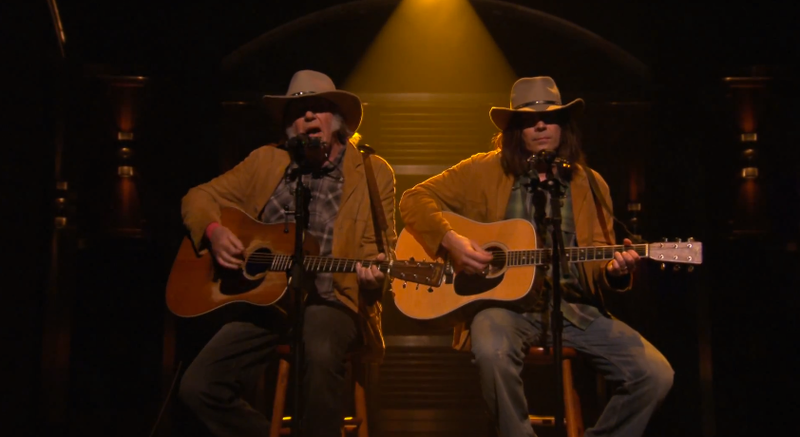 Dressed in vintage Young attire, Fallon began the tune in a lone spotlight before the real Neil jumped in to exchange verses and looks during the performance. Young reappeared later in the episode for an interview to promote his new high quality audio music player, PONO. The guitarist closed the show playing “Who’s Gonna Stand Up?” – from his latest album, “Storytone” – with The Roots and an expanded band that included a horn section and backup singers.